Where can I buy a good new or used canoe? This question comes up more often than you might think. 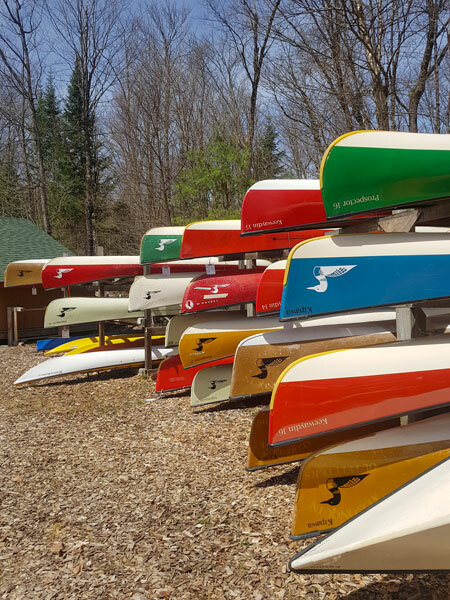 Whether it’s the beginning of paddling season or the middle of winter, people always want to know where they can buy a good used canoe, and many of them turn to us as they know our rental fleet consists of some of the best canoes on the market. Swift Canoe will be featuring a spring sale at our Oxtongue Lake location. There’s not better time to buy and enjoy a new, or new to you, canoe than the spring. Every year we sell off a number of retired rental canoes that have seen several seasons of rental use and will always have scratches and patches on the hull. All of our canoes have been reconditioned to a “no leak” condition, some may even have had new paint jobs. All are a good value. Most used Kevlar models sell between $1000 and $2000 (about half to a third of their original retail price) and fiberglass models sell between $500 and $900. The most popular used models are Algonquin or Prospector 16 & 17 and the Swift Kipawa 16’6″. Please visit our Used Canoe page for a list of models currently available. We do get a lot of calls from customers looking for the elusive $300 ultralight Kevlar canoe. Considering that most new Kevlar canoes cost $3000-$4000, you can just imagine what a used one valued at $300 would look like! One thing to consider is that usually the lower the price, the more TLC your used canoe will require (or the heavier it will be).